ASEAN is a loose union of 10 nations in south east Asia. Nations include Singapore, Myanmar, Indonesia, Malaysia, Thailand, Vietnam, Cambodia, Brunei, the Philippines, and Laos. Rather than a strict structure, it is much looser than the likes of CARIBCOM, and the EU. It is not in the habit of criticising its member states, with the likes of Myanmar's terrible human record only being awarded a mild rebuke. The organisation prefers to work through consensus, and is slowly trying to bring greater economic development to the region, with a long term goal of a more formal structure, somewhat akin to the EU. 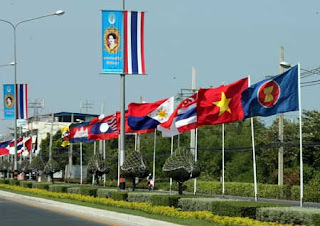 The flag for ASEAN consists of 10 stalks of rice on a red disc, edged in white, on a blue field. The blue represents stability, the red represents dynamism, white represents purity, and the gold represents economic progress.